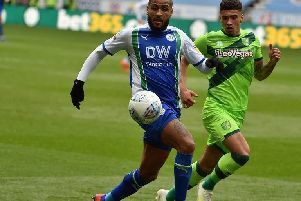 Leon Clarke saw a stoppage-time 'winning goal' controversially chalked off for offside as Wigan Athletic were held to a 1-1 draw against Championship leaders Norwich at the DW. Latics had gone into the game with only a one-point buffer to the drop zone after Saturday's results, but deservedly led at the break. Sam Morsy's shot was adjudged to have hit a Norwich hand in the box, and Reece James converted the spot-kick with remarkable composure. Latics then created several chances to double their lead which they failed to take, with James firing just over on a couple of occasions and Clarke seeing an effort diverted inches wide by City goalkeeper Tim Krul. And City made them pay 10 minutes from time when Kenny McLean fed Teemu Pukki, who slid the ball under Christian Walton. There was almost another sting in the tale during the EIGHT added minutes, with Latics finding the net for what they thought was a winning goal. But Clarke's header, from James' free-kick, beat Krul only to be was ruled out for a very contentious offside call. 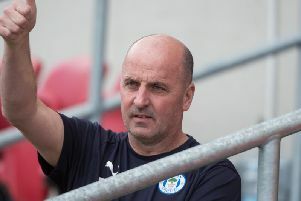 Nevertheless, Latics extended their unbeaten run at home to eight matches. And if they can retain this level of performance for the run-in, they'll give themselves every chance of picking up the points necessary to avoid the drop. Looking to bounce back from the midweek defeat at Hull, Latics were on the back foot from the off, and were lucky Pukki miscontrolled in the box after good work from Onel Hernandez. Latics managed to get Gavin Massey away down the right channel, but he was forced into a tight angle and his shot deflected across goal for a throw-in. Morsy fired wide from 25 yards, before James found Clarke with an inviting free-kick, but the big man couldn't keep his header down. Great stuff from Morsy then released Clarke but, with Lee Evans flying up to offer support, the striker ignored him and saw his shot deflect wide of the mark. At the other end, Marco Stiepermann's cross took a touch off a Latics defender on the way through the six-yard box, somehow evading Pukki at the far post. Evans, playing in the No.10 role for the first time, was enjoying his more advanced role, and saw a diving header, from Antonee Robinson's delivery, well saved by Krul. Kal Naismith then saw a shot deflect just wide of this near post, before Latics were awarded a penalty. Referee James Linington took his time before deciding Morsy's shot had been deliberately handled, and James slammed home the spot-kick in emphatic fashion. Credit Norwich, they responded well at the start of the second half, and Walton was needed to make a great save to deny Hernandez. Norwich, roared on by over 5,000 travelling fans, were coming more and more into it, and Walton did well to parry a shot from Pukki, who sliced wide moments later. Lovely interplay between Robinson and Evans for Latics saw the American international full-back try his luck from distance. But unfortunately his right foot wasn't at the level of his left and the ball soared into the away end. Latics were inches away from 2-0 when a lung-busting run through the midfield by Naismith released Clarke through the middle. The on-loan Sheffield United man beat the last defender, but his stab towards goal was diverted just past the post by Krul at full stretch. James fired a free-kick inches over the top, before Josh Windass and Nick Powell took over from Massey and Naismith. Norwich themselves made a triple change with around a quarter of an hour to go, and they found a leveller shortly after through top scorer Pukki. Lattics were forced into their final change when Danny Fox limped off to be replaced by Jonas Olsson with seconds of normal time to go. But the home side weren't content to play out time, and would have won it in added time only for a debatable offside flag to deny Clarke.